Whitehouse Labs continues to demonstrate leadership in the area of container qualification by offering testing services fully compliant with USP chapters 661.1 and 661.2 effective May 1st, 2016. Whitehouse Laboratories is now fully operational with respect to these chapters, providing services and advice to clients navigating the change. Through the newly effective chapters, 661.1 - Plastic Materials of Construction and 661.2 - Plastic Packaging Systems for Pharmaceutical Use, the United States Pharmacopeia Convention (USP) aims to further its mission of improving global health through public standards. USP 661.2 Plastic Packaging Systems for Pharmaceutical Use provides test methods and standards for assessing complete package systems composed of materials considered well characterized through USP 661.1. While the changes to these chapters represent a radical shift in test methodology, Whitehouse Laboratories is working together with clients to custom tailor container qualification solutions for resins to finished product packaging. "I am very pleased that we have been out front on this change meeting with our clients and discussion with USP in order to provide the proper service for our clients," states Mark Stier, Whitehouse Laboratories General Manager. Ultimately, these changes to the USP represent a modernization of the chapter designed to create a well characterized container closure system. Whitehouse Laboratories is uniquely qualified to perform the testing required to demonstrate full compliance with the proposed 661.1 and 661.2 chapters. Whitehouse Laboratories maintains a “Container Testing Center of Excellence”, a facility dedicated to the multi-faceted assessment and development of containers and packaging materials. Our specifically trained staff members are on-hand to offer advice and provide more details about USP compliance capabilities. About Whitehouse Laboratories The leader in testing, Whitehouse Labs, a division of Albany Molecular Research Inc., offers comprehensive analytical services providing support for manufacturing from development to market. 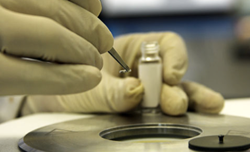 From analytical chemistry and material qualification to packaging optimization, Whitehouse Laboratories is the testing partner for the world's leading pharmaceutical, biotechnology, medical device, life sciences and consumer products organizations.